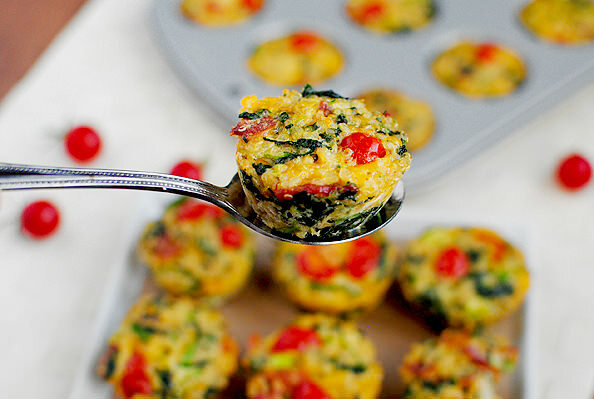 Mini BLT Quinoa Cups are the perfect bite-sized gluten-free snack, breakfast, lunch, or dinner recipe! Easy and healthy. I kinda sorta don’t want to admit how many Mini BLT Quinoa Cups I ate just now. Not only is the number too tragically high to verbally confirm, thus making it real, but I don’t even know the exact number because I lost track. I LOST TRACK OF HOW MANY MINI BLT QUINOA CUPS I ATE. Who does that?! Me, that’s who. And you will too after one warm and savory bite. I don’t even particularly care for BLTs – I always feel like there’s something…missing? – but am going completely cuckoo for these babies. 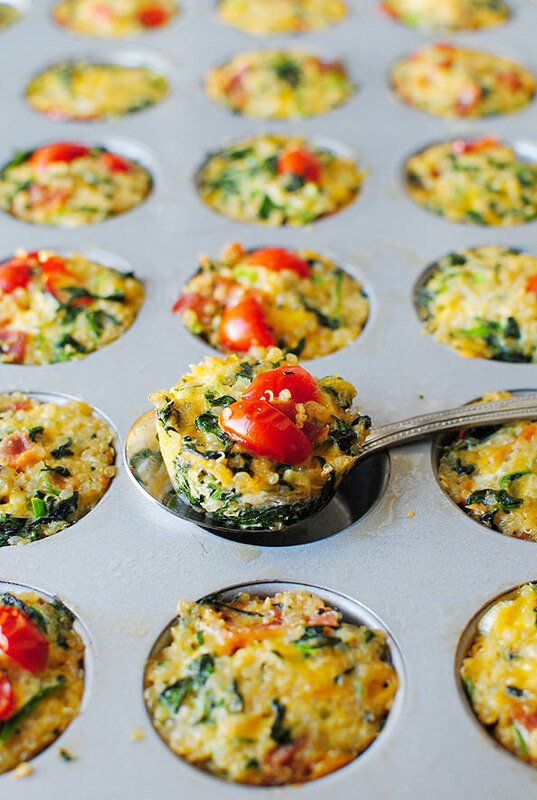 Based on one of my most popular recipes here on IGE to date, Mini Ham & Cheese Quinoa Cups, Mini BLT Quinoa Cups combine cooked quinoa with salty bacon, chewy spinach, fresh tomato, and melty cheese, in an irresistible twist on the classic BLT sandwich. Plus, check out their sweet, mini size – squee! 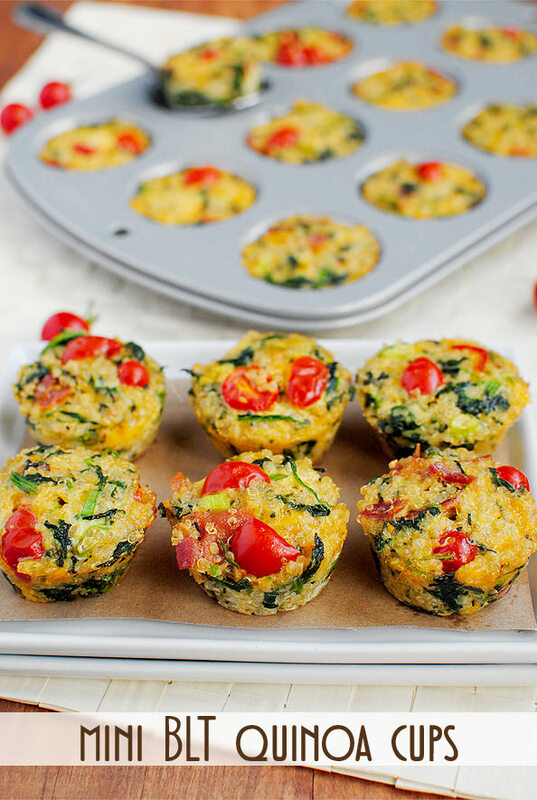 Bake these 2-bite Mini BLT Quinoa Cups for a filling breakfast, yummy snack, or to take with you to any party or potluck. 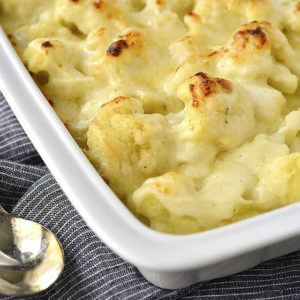 Heck, bake ’em on any day that ends in -y because they’re sodanggood, mmkay? 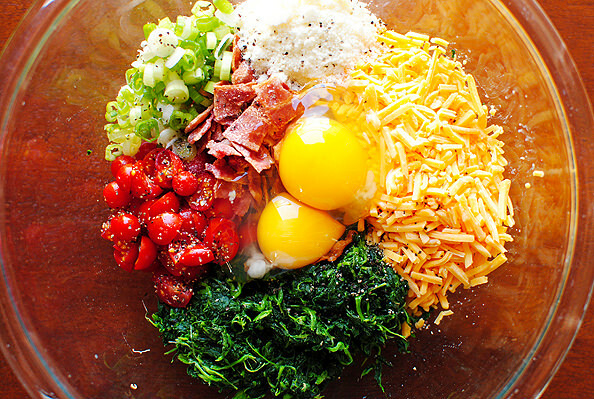 After some prep work including chopping 1/2 cup tomatoes, cooking then chopping 1/2 cup bacon, chopping 1 green onion, and squeezing the excess liquid from 1 cup frozen –> thawed spinach, stir the ingredients together in a big bowl with 2 whole eggs, 3 egg whites, 1 cup shredded cheddar cheese, 2 Tablespoons parmesan cheese, and lots of salt & pepper. Next stir in 2 cups cooked quinoa. To get 2 cups cooked quinoa, rinse 3/4 cup dry quinoa very well in a fine mesh strainer, then simmer in 1-1/2 cups boiling chicken broth for 15 minutes, or until the broth has been absorbed. 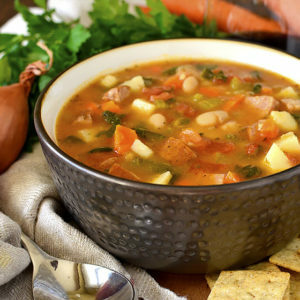 You could totally use water, but the chicken broth gives the quinoa even more great flavor. 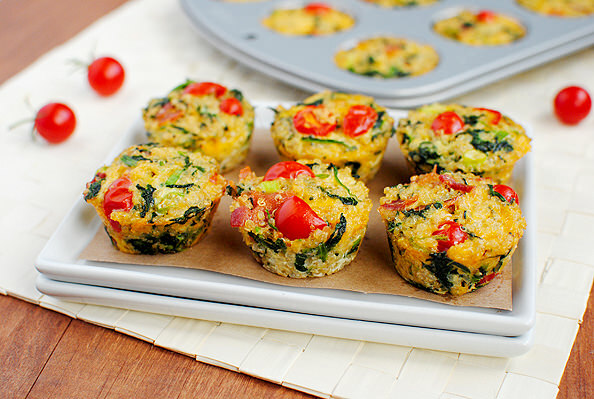 Spray a mini muffin tin VERY well with non-stick spray, then scoop the quinoa mixture into the cups, filling them to the very tip top. Smooth the tops with the back of a spoon, then bake at 350 degrees for 15-16 minutes, or until the tops are golden brown and bubbly. 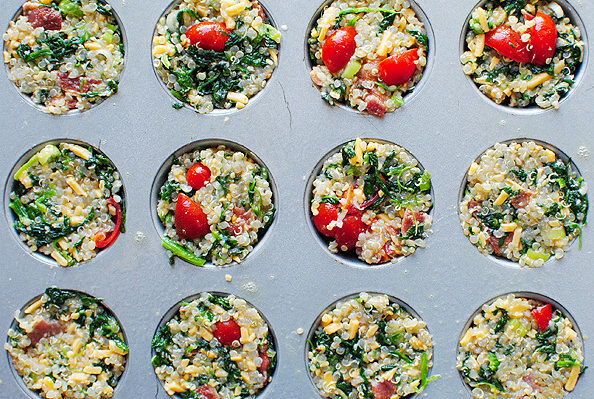 Let the quinoa cups cool for five minutes then pop them out with a spoon and place them on a cooling rack. You may need to run a knife around the outside of some of them before popping out, FYI. Good hot, cold, or room temp – you do not want to wait to bake these! 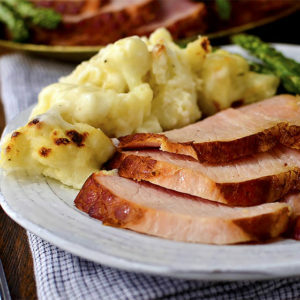 If (that’s a big IF,) you have any leftover after the initial devouring, pop ’em in the fridge or freezer, then reheat in the microwave. I doubt you’ll have the need though! 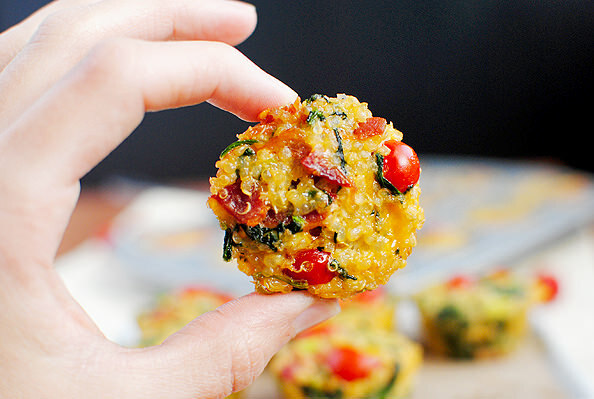 Also check out my Mini Ham & Cheese Quinoa Cups, and Mini Pizza Quinoa Cups! This is getting ridiculous. I think I pin every single one of your posts! :) Thank you for having such a wonderful blog! I cannot wait to make these!! They look amazing. These look so good! I’m on vacation now but I’ll definitely have to make these when I get home! Yummy. 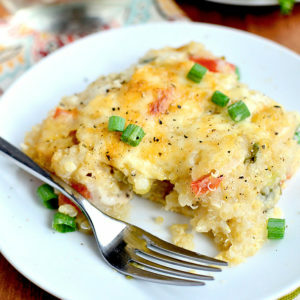 Making this right now! :) is it 5 egg whites total or 3 eggs but not the yolk from one? 5 eggs – 2 whole eggs, then just the whites from the remaining 3! I’ve been reading your blog for a long time now, but just thought I should finally be brave enough to comment. 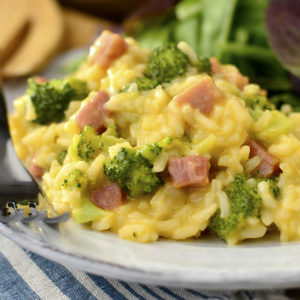 I love how your recipes are fresh, delicious, and simple! Thanks for a great blog. Ohhh, yum! I just made quinoa cups for my first time last week (pizza flavored!) and totally obsessed now. The possibilities are endless! These are adorable! I am adding these to my next brunch party. Love this idea!! I totally agree with Aria above…I feel like I pin everything you post! Your recipes are fabulous! And, I love the way you write. Fantastic blog!!! 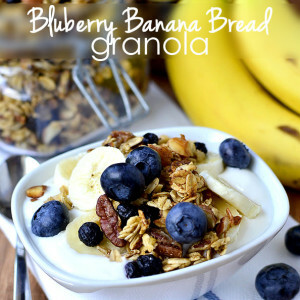 I love these for a quick grab and go breakfast! Definitely will be giving these a try! I can’t wait to spice up my breakfast with these babies! Yum! These look AMAZING. I can’t wait to try them! Portable proteiny breakfast food is always a must! 3 words: LOVE LOVE LOVE!!! Going to make these this week!!! Thanks for the recipe – YUM!!! I’ll try these little guys soon. I made your skillet chicken parmesan last night, as you say so damm good and easy. 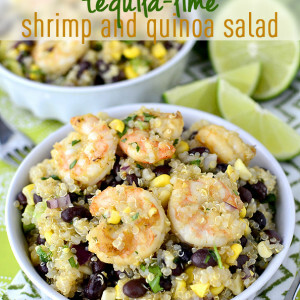 I really want to like quinoa but I just don’t. 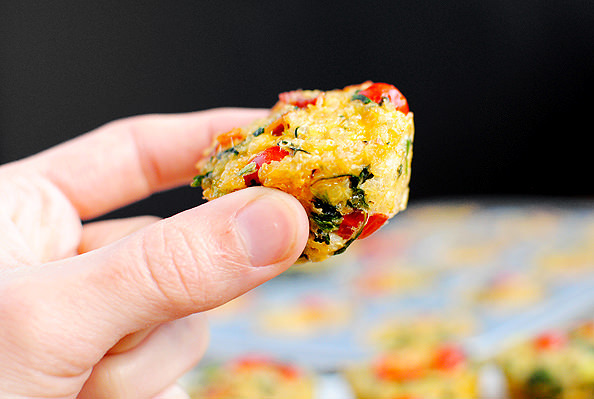 I tried your mini ham and cheese quinoa cups and they were such a fail we threw several away. Could it be that I didn’t rinse the quinoa well enough? Should I try again? Sorry to hear that, Mar! 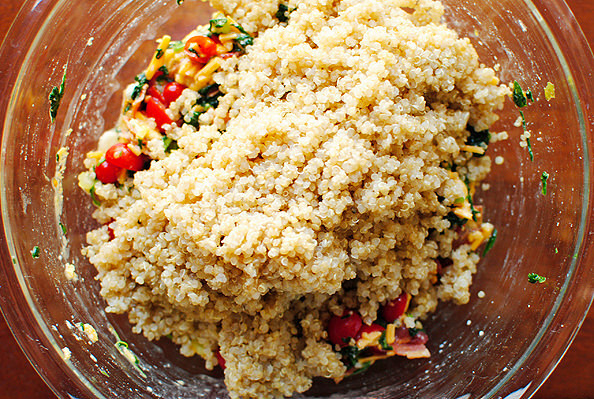 Yes, rinsing quinoa very well is imperative, as quinoa has a naturally-occurring bitter outer coating called saponin. I use a fine mesh colander like this one: http://astore.amazon.com/iogiea09-20/detail/B00004OCLX, and rinse for at least 1 minute before using! What is poppy quinoa? Is it different than regular? Nope! It’s the same, just describing the texture of the cooked quinoa! I am obsessed with quinoa. 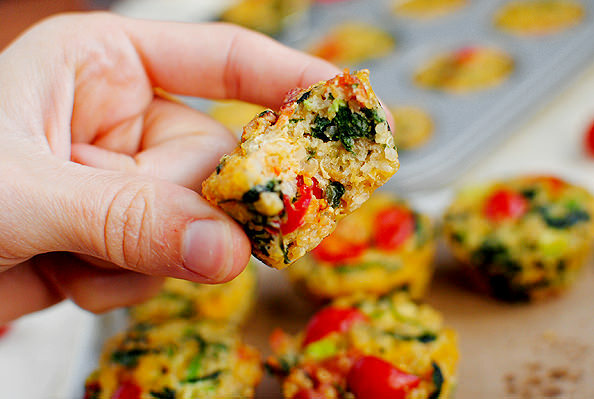 And I need to go find a muffin tin ASAP, because these sound heavenly! And healthy too! Okay, I know you say to spray it but do the cups really not stick all over the pan? I did this once with cute little Egg /Bacon/Cheese mixtures and it ruined my pan! Any suggestions?! 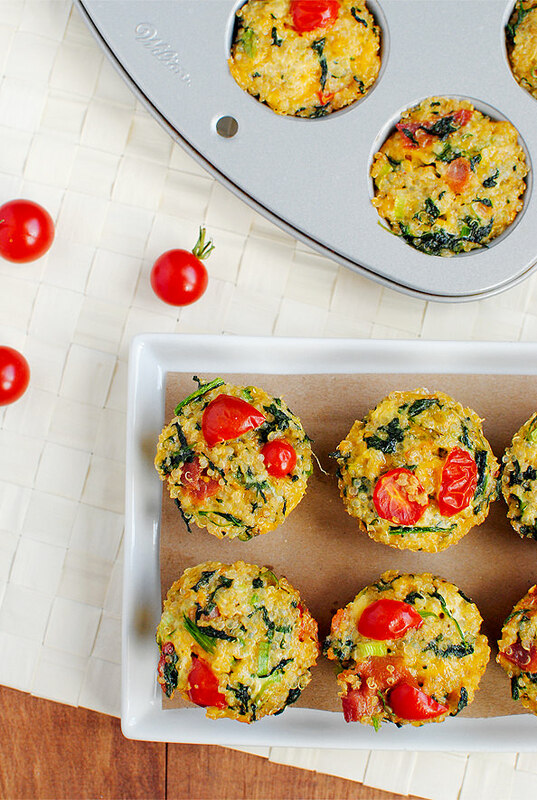 Kristin,I love your blog-the pictures, the stories and the recipes.I made these cute little quinoa cups for dinner with leftovers for breakfast. Today I made your superfood salad with lemon vinaigrette and I honestly had to stop from eating the entire salad myself. Love the textures and the different flavor sensations. Keep up the good work. This lady from Boston MA loves your blog. Thank you so much, Wendy! Glad you are enjoying the recipes! These are beautiful! I work in my car and am always looking for new portable things. I feel so much more professional when I am talking to a client, look down and have quinoa stuck all other the front of my shirt. I’m going to try this. I only have normal-sized tins and don’t have a microwave. How do you think the size will change cooking time and do you think popping them in the toaster oven for a few minutes would be okay for reheating? I would add 5 minutes or so onto the cooking time, and heating them for a few minutes in the toaster oven should be just fine! Excited to try these! Do you think a bulk batch of these would freeze/thaw/reheat well for busy mornings? Definitely! Just pop them in the microwave for 30-45 seconds! I’m curious if you’ve tried any sweet version of the quinoa cups? I’m always looking for healthy and filling things I can reheat for my kindergartner to eat before school but he has more of a sweet tooth for breakfast. I’m thinking apple cinnamon or chocolate chip maybe. I haven’t, but I have seen a bunch of breakfast quinoa recipes that treat it like oatmeal, so I’m sure it’d be delicious! 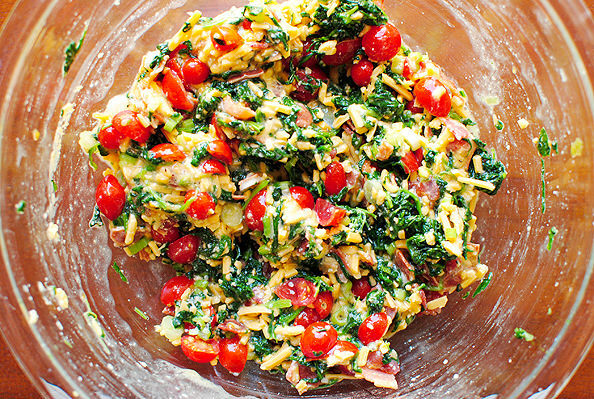 I made these last night as an appetizer and they are FENOMENAL!!! Since I did not have a mini muffin tin I just added a bit of rice fluor (tasteless but binds well) and made little balls on a regular tray. Worked perfetly! Thank you! I’m looking for some yummy stuff to make for my kids, but I have limitations. Food allergies to work around. My little one is lactose intolerant & I’m not able to have much dairy either, I’m also allergic to tomatoes. Was wondering if maybe you’ve delved into the gluten free category much as well. Let me know, because I’d like to try some of the recipients & can do the gluten free conversions with no real problems, but the dairy free is harder since vegan cheeses are just plain gross & hard to come by. Just made these and they are great. I can’t stop eating them!! Thank you for sharing. Wow these look delicious! The photography really does look amazing! i think I’ve got most the ingredients floating about in the fridge, so I’m off to try them now! These are terrible! JUST KIDDING – I can’t stop eating them! I left out one of the eggs and substituted flax seed instead, and used half the bacon, but greased the pan with the bacon grease. Delicious! Thanks for sharing! I bookmarked this recipe a while ago and finally got around to making them! Delicious! Thanks for another great recipe! I made these with some significant variations because I didn’t have tomatoes or bacon. Ha! A BLT quinoa cup with no B or T. Instead, I’ll call mine a Mini Lasagna Cup. I also used fresh spinach instead of frozen. I LOVED these, and I would not share with my family. The lasagna that I make also requires mixing eggs with grated mild cheddar and parmasean cheese. 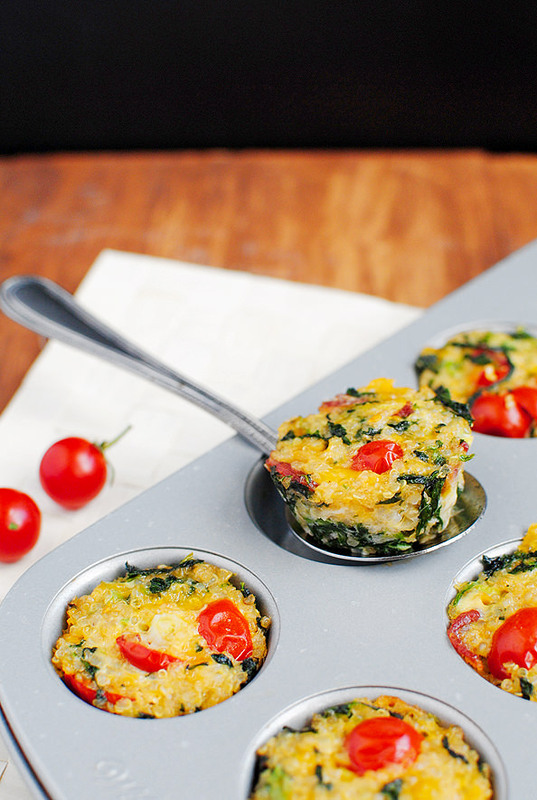 These Mini “Lasagna” Cups turned out to be very similar – except without the pasta sauce. I loved them for breakfast, lunch, dinner, or a snack. I am definitely making these every week. these sound amazing. 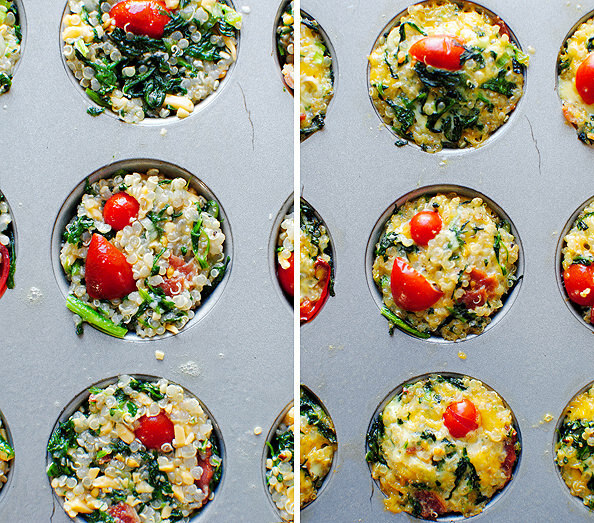 can i make in a regular muffin tin instead of mini? would i have to change the recipe at all? thanks. I have never made them in a regular tin though I know others have made the other varieties with success. I would just watch cooking time – you might need to tack an extra 5-10 minutes on!